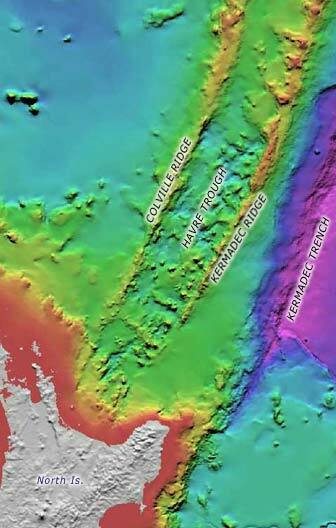 The deep, rough seabed of the Havre Trough lies between the Colville and Kermadec ridges. This area, where the earth’s crust is being stretched apart, continues onshore at the Bay of Plenty into the Taupō Volcanic Zone. The Havre Trough is opening up, moving the Kermadec Ridge with its many active conical volcanoes, eastwards away from the Colville Ridge with its extinct ones.